On Nevada’s western border, framed by the Carson Range of the Sierra Nevada and the Pinenut Mountains, the Carson Valley unfolds. Broad and green, nourished by the Carson River and its tributaries, the Valley appeared as an oasis to early western settlers drawn by the California Gold Rush of the 1840’s. Among those settlers was John Reese, who established the first permanent settlement in Nevada at Genoa in 1851. Today, Genoa appears much as it did in that era. It still resists traffic signals, and visitors to its center will find more than a few examples of nineteenth century architecture within strolling distance. Among those structures, Mormon Station State Park, the Courthouse Museum at Genoa, the Genoa Town Hall and Nevada’s Oldest Thirst Parlor (just call it the “Oldest Bar”). Not long after the founding of Genoa, the beginnings of Gardnerville; a hotel, blacksmith shop and saloon were built along what is now Highway 395; and Minden, just to the north, was created to provide a terminal for the V & T Railroad a few decades later. Today these two towns have grown into true communities, offering the visitor dining and shopping experiences along with town parks and a vibrant cultural scene. Restaurant choices include several that reflect the area’s Basque heritage and shopping options feature a surprising array of small antique shops and boutiques. The Carson Valley Museum and Cultural Center documents the area’s history in the former Douglas High School, a Frederick Delongchamps designed building that is listed on the National Registry of Historic Places. Heritage Park in Gardnerville and Minden Park are classic turn of the century gathering places and often the site of concerts and events. Yet just a short distance from Main Street, pasture lands and working ranches set against the mountains remind you of the valley’s ranching roots and those same open spaces, protected by the valley’s residents, provide an abundance of recreation. Hiking and biking trails wind through Carson Valley and into the foothills on either side. Horseback riding is the reason many choose to live in the valley and if your preferred mode of transportation is the mountain or road bike, hot air balloon, ATV or motorcycle, you’ll have your chances too. For water sports enthusiasts, Topaz Lake, just 15 minutes south of Gardnerville, is known for its waterskiing and wakeboarding, fishing and boating. Golfers will feel right at home here. Four valley courses, varying widely in terrain and difficulty, are a reason to visit in themselves. Whether you prefer tight fairways that meander along the river or open links-style courses tucked against the mountains, you’ll find a challenge here, and typically those challenges are available year round. 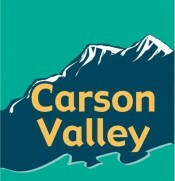 There is also one particular form of recreation for which Carson Valley is known all over the world. The valley’s contours and wind patterns bring soaring enthusiasts from every continent to ride the thermals in unpowered, fixed wing aircraft. Numerous gliding records for distance and altitude have been set here and commercial operators at the Minden-Tahoe airport offer rides and lessons. If you’d rather view the birds than fly next to them, you should know that every February, during the calving season, eagles and other birds of prey come to the valley to feed on afterbirth and bald and golden eagle sightings are common. Eagles & Agriculture, a gathering that celebrates this phenomenon, provides lectures, sighting tours and photography workshops during the height of the viewing period. Eagles & Agriculture is just one of the special events held in Carson Valley during the year. The Genoa Cowboy Poetry & Music Festival, held in the spring, is the newest, debuting with tremendous entertainers, workshops and artisans in 2010. June’s Carson Valley Days, a salute to small American towns, brings concerts, a parade, arts and crafts shows and more to the towns. Each September features the return of the Candy Dance, a Genoa tradition 90 years old, which began as a way to raise funds for town improvements. Over the decades it has grown into an event that draws tens of thousands of visitors for the candy and the offerings of artisans from all over the West. In addition to the signature events above, throughout the year, concerts, theatrical performances and a variety of community contests, club meetings and social and educational events fill out the calendar. They meet the special interests of residents and help to weave the tapestry of life in Carson Valley.